There’s a lot to be said about muscle memory. I subscribed to Google Play Music in July 2013 and have been using it almost exclusively to listen to all my music since then. The only time I use a local media player on my laptop is when I want to listen to a bunch of high resolution albums I have in FLAC, which isn’t all that often these days. So it still surprises me, then, when I find myself using — without a second thought — all the important keyboard shortcuts in Winamp! WinAmp interface showing the album being played is Fleetwood Mac’s ‘Rumours’. 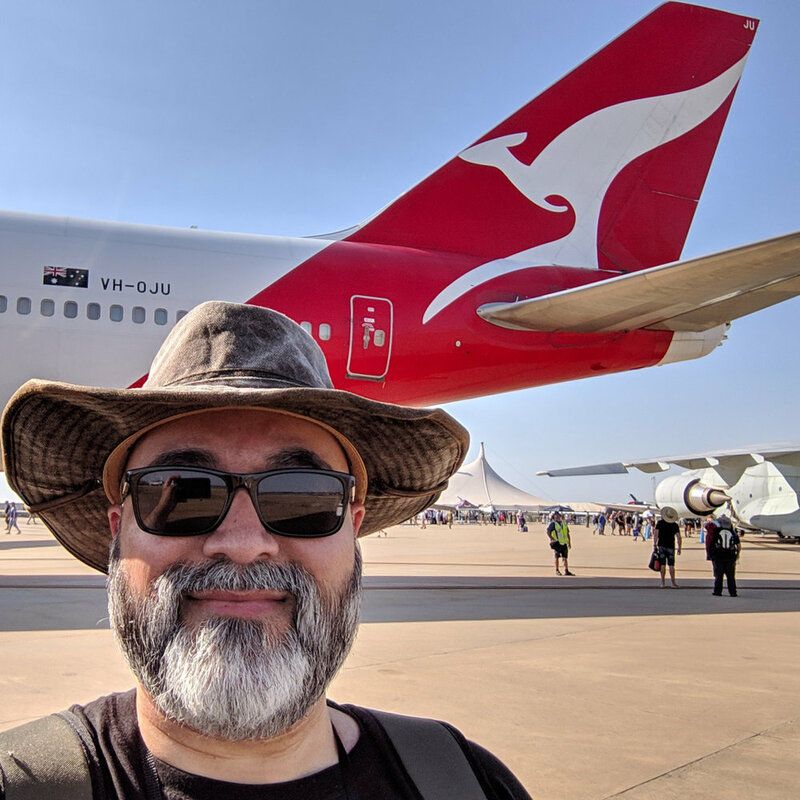 I love aviation, so it’s awesome that we live in Melbourne, which is close to Avalon Airport where the Australian International Airshow (usually just called Avalon Airshow) is held every couple of years. 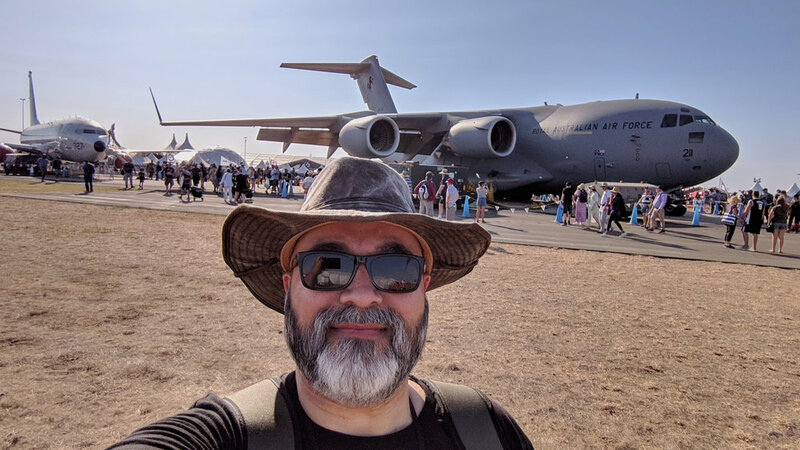 Last time I got to take an inside tour of one my favourite military transport aircraft, the Boeing C-17 Globemaster III, so this year I just enjoyed it from the outside. Of course you have to walk quite a way away before you can take a selfie that shows more than just one section of the Globemaster! 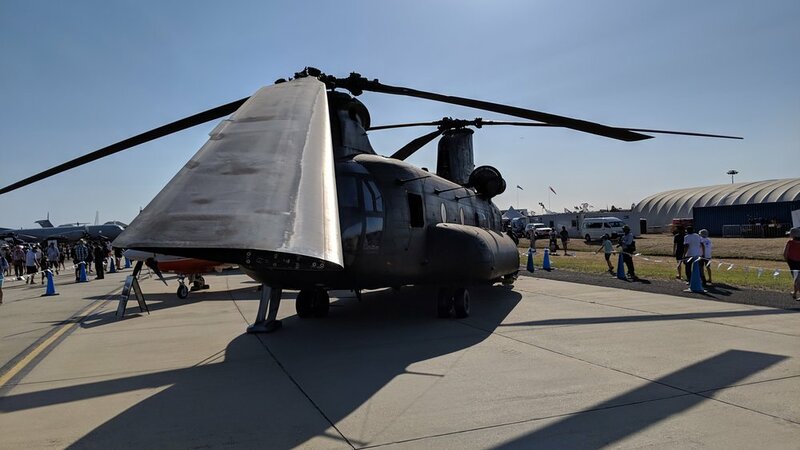 Other cool military transport aircraft I got to check out included the Lockheed Martin C-130J Super Hercules (from Republic of Singapore Air Force), Kawasaki C-2 (from Japan Air Self-Defense Force), and Boeing CH-47 Chinook (from Royal Australian Air Force). Speaking of air forces, there was also an air force dog there! Coming back to aircraft, some of the other highlights for me were this Beechcraft Super King Air (from Ambulance Victoria), Eurocopter AS365 Dauphin (from Victoria Police), and Douglas DC-3 (from Melbourne’s Gooney Bird). It was a super hot day so I didn’t have the time or energy to check out much else, like the indoor exhibition booths, seminars, military dog performances, and drone racing – all of which I wanted to go to. But I did get to check out this model aircraft display from Victorian Model Aeronautical Association. I also didn’t get to watch many of the flying displays properly – though I did get to follow the aircraft around with my binoculars, so that was cool. I had specifically wanted to watch the Globemaster in action, and even timed my day to be in the public viewing area when it was due to fly. Unfortunately, due to air traffic issues, its slot was rescheduled. So I had to make do with seeing it zip back down the runway to await a future slot. Oh well. Here are some snippets from what I did get to see. Finally, just before I left, I checked out the one bit of equipment you don’t ever want to use, but you’re very happy to see in the hugely capable hands of Airservices Australia. All in all, I had a really fun time. And, given it was going to be a 40-degree day at Avalon, my plan of getting to the airshow just after gates opened and 8am and leaving around lunchtime worked out exceptionally well. So much so that I’m already looking forward to the 2021 show! I do lots of things to keep myself as secure and private as I can online – so many that I figured I’d make a list. Update: Check out my follow-up post for my list of ‘Firefox extensions for privacy and security’. Much of my life is on the internet so slow network speeds really irk me. Which is why, two years ago, I moved my personal mobile account from Telstra to iiNet. Back in 2016 the Optus mobile broadband network had among the best 4G data speeds: 21% faster downloads and 33% faster uploads compared to Telstra (when measured from my office). And the prices offered by resellers of that network, in my case iiNet, were significantly lower too. I currently spend about a third of my day in the office every single weekday. When I’m there I connect my work phone to the corporate Wi-Fi network. However, for various reasons, I don’t connect my personal phone to work’s guest Wi-Fi network. So, for over half of my weekday waking hours (more if you count my commute), I rely on my phone’s 4G connection. This was all well and good till about two months ago. My office is in Collins Square, which is a five-tower complex in Docklands, Melbourne. Two months ago we moved offices from a tower at the front of the complex (adjacent Collins Street) to a tower at the back (overlooking the Yarra River). The views from this new building are much better, but the 4G download speeds for Optus mobile network users are much, much worse. My work phone is with Telstra, so I was able to compare the 4G download and upload speeds I was getting from both Telstra an iiNet in this new building. The results speak for themselves. The 4G speeds I was getting from iiNet were better than what they were in 2016, of course, but they were 8 times slower than what I was getting from Telstra. Telstra has always had better mobile and mobile broadband coverage in both urban and rural areas across Australia. That superior coverage was making all the difference here. An investigation revealed that the the iiNet cell tower that gave me the best signal strength in the new office building was behind two of the other Collins Square buildings. Meanwhile the Telstra cell tower that gave me the best signal was just across the river. So, yeah. The decision to switch back to Telstra was about as easy as it had been to switch away in the first place. The good news is that, over the last two years, Telstra’s customer service has improved considerably. Ten minutes with an agent at one of their stores was all it took to make the switch back. And, as a bonus, I’m getting three times as much data from Telstra for the same monthly price I was paying at iiNet. Update 4/2/19: Since publishing this post I discovered that Telstra has activated a cell tower at the top of Collins Square! Since that’s the tower my phone now connects to most often, my 4G connection is now even faster and is considerably more reliable from all corners of the office. The NBN is 62% faster in our new house! This time last year we finally got connected to Australia’s National Broadband Network (NBN). Doing so dramatically increased our average download speed from 6.9MBps with ADSL2+ (over the old telephone copper wire network) to 46.7MBps with NBN (over a new NBN fibre optic connection to the closest telephone/internet exchange). A little over a week ago we moved into an independent house in another suburb. This meant we were no longer sharing that fibre optic internet connection with the other residents in an apartment block. I checked to see if this had increased our connection speed and, sure enough, our download speeds have gone up by 62% to 75.7MBps! We're finally connected to the NBN! But it wasn't till yesterday, 15 December 2015, that we finally got connected to Australia's National Broadband Network (NBN). Yes, this took 1 year, 5 months and 22 days. What was particularly irritating was that our neighbours got connected several month ago. It took us this long because we're in an apartment building. Which meant that, first, our Body Corporate had to get their act together and network our building — which they finally did at the end of October. We then had to wait till iiNet, our prefered ISP (who we've been with for over six years), released their Fibre to the Basement plans for selling NBN services to individual apartment building residents. We're now enjoying download speeds seven times faster than our old ADSL2+ connection (an average of 46.7Mbps with NBN versus 6.9MBps with ADSL2+) and upload speeds thirty-one times faster (27.6Mbps now vs 0.9Mbps previously). We're also connecting faster, with an average ping time of just 2.5ms with NBN vs 27ms with ADSL2+. Of course these speeds aren't as fast as the NBN can theoretically reach ("up to 100Mbps") or as fast as my internet connection is at work (average downloads at 64.3Mbps and average uploads at 86.9Mbps) — but it still pretty darned good. And it's more than enough for any video streaming we want want to do. So, yay! The NBN was a long time coming, but it was sure worth the wait. As I said in my previous post, I'm ready to buy my first mechanical watch. Now people in this situation usually look to well-known Japanese brands like Seiko and Orient since these companies produce excellent quality mechanical watches that aren't very expensive. And if I was looking for a dive style watch I'd definitely get the Seiko SKX007K1 or Orient Ray EM6500CD. Or, if I was looking for a field style watch I'd get the Seiko SNZG11K1. Or, if I was looking for a dress watch, I'd get the Orient Bambino ER2400CN. But, no, I'm an aviation enthusiast so I want to get a pilot watch. Eventually, I'll want to get myself something like the Breitling Navitimer 01 (which costs $9,800) or the Breitling Navitimer 1461 ($13,400) but that won't happen for another couple of decades at least. Which is fine because the type of pilot's watch that I adore is the flieger style watch from WWII. Now the Seiko 5 Military SNK809K2 does have some pilot/flieger characteristics but it's not quite what I'm after. And the Orient Flight ER2A001B is closer, but it's still a loose interpretation of the original and I'd rather get something more visually authentic. Of course, before I go any further, I should explain what a flieger style watch is. For flieger style watches we're interested in part five of that series. So where did the classic "flieger" look start? They came in two types: Type A for pilots and Type B for navigators. Because no one company can claim to have designed or built the original flieger style watch lots of companies now make them. Most of the luxury flieger style watch are Type A, though, and I much prefer Type B. The one Type B I do like from this bunch (the Bell & Ross Vintage WWI) happens to be the cheapest of the lot - but is still not something I can afford just yet. Fortunately, there are a number of Type B watches from enthusiast-level watch brands. The STOWA Flieger Baumuster B and Archimede Pilot 42 B Automatic are the most original-looking (and I love them both) but I think the Hamilton Pilot Auto is my favourite. Yes, Hamilton have tweaked the design a bit and have even added a day/date complication - but I really like their interpretation. In fact, I like it so much that, as far as pilot watches go, I'll settle on this on till I'm ready to buy a Breitling. But, for now, these watches are still out of my price range. The watches that are in my price range also come from enthusiast-level brands - though from the lower end. I love both the STEINHART Nav B-Uhr B-Type and the Laco Aachen Type B Dial Automatic but, on balance, I think I prefer the Laco. Aside from the fact that Laco is one of the companies that made the original B-Uhr watches back in the 1940s, I prefer its full lume and open case back. Also, Laco's movement is made in-house - which is a plus for any watchmaker. The one last category of watch brands I should mention are the less well-known consumer brands. So not the Seikos and Orients of the world, but the brands that build cheaper watches that generally work well and are still decent enough looking. For example, TISELL is a Korean brand that uses off-the-shelf Chinese watch movements from Sea-Gull. And Ticino is a German brand that uses both Chinese Sea-Gull and Japanese Miyota movements (Miyota is owned by Citizen). Watches with Sea-Gull movements used to be hit-and-miss but both TISELL and Ticino do their own quality control with these movements so their watches generally run well. Each of these brands makes a Type B flieger style watch. The TISELL Type B Pilot uses a Sea-Gull movement while the Ticino Type B Automatic uses a Miyota movement (their Type B watch from last year used a Sea-Gull movement but this year they're moving a little up-market). Both of these are decent enough watches. They have stainless steel cases and sapphire crystals, and they generally run well. But brand like these save money with cheaper movements, lower production costs and fewer subtle refinements. Which means these two watches are less water resistant, they're not quite as well-built or finished, they use a dimmer lume, and their straps aren't particularly good. Also, they don't have much of an after-sales support, maintenance and repair network to turn to if they're not working as well as you'd like. And, given that I have a limited budget, what am I willing to compromise on? Finally, do I have a brand preference? That $200 decision was the hardest. If I had just $200 I'd either have to get the Orient Flight, which is not my favourite flieger interpretation but I know will be built well and is guaranteed to run really well. Or I'd have to get a TISELL or Ticino that, while more faithful to the original design, may not be built as well or run as well. Also, for completeness' sake, if I actually had $4,000 just lying around, I wouldn't go for that particular Bell & Ross watch, either. I'd already own those Laco and Hamilton Type B flieger watches and I wouldn't want another one. Instead I'd go for a different Bell & Ross watch or something else entirely. The other two watches I've owned were a Pulsar LED (the one I got when I was seven) and a mechanical hand winding watch that I don't remember the brand of (I was twelve at the time). The cool thing is that I have I reached a point in my life at which I'm ready to move beyond watches as primarily practical time telling tools. I now want to get watches that, while still good for telling time, are also pieces of jewellery and objects of design, engineering, craftsmanship and history. So, aside from another couple of quartz watches I'll probably want to get in the future (a Casio ProTrek and some type of chronometer), this means I'm looking to get myself my first proper mechanical watch. I've spent the last few months researching watches and world or horology - both online and in local stores in Melbourne - and, over the next few months, I'll summarize what I've learnt on this blog. What types of watches can you get? Historically, wristwatches have been tool watches. In the early 1900s people were perfectly happy with pocket watches (though women sometimes wore watches as jewellery on their wrists) but, when it stopped being convenient to pull a watch out of your pocket - like when you were diving, flying, driving or marching across Europe in your army - wristwatches started to become popular. There are just the big bucket watch styles, of course. There are many variations within these styles and a handful of other styles, as well (e.g. single hand, Bauhaus, fashion). And a lot of these styles and variations overlap, too. Note: I haven't included the independent watchmakers of the Académie Horlogère des Créateurs Indépendants (ACHI) in that list because, let's face it, I'll never be able to afford any of their watches. It's useful to know that a number of these brands are owned by large multinational holding companies. Breguet, Blancpain and Glashütte Original from the high-end luxury group. Piaget and Vacheron Constantin from the ultra luxury group. Hublot and Zenith from the high-end luxury group. Also, Tudor is Rolex's lower-end brand and Orient is owned by Seiko. I'm sure there are other brand partnerships and joint ownerships out there. You can buy a watch for almost price - from a $25 Casio to a $250,000 Hublot - and different people create different price-range buckets for watches. So that was just the basics. There's a lot more to summarize but I'll try to do that over the next few months (though it'll probably take years since there's so much to learn). Instead, let's move on to something more interesting: like actually buying a watch. That's what my next post will be about. My Gigabyte laptop has an excellent LCD display that came almost perfectly calibrated out of the box. It's easy to forget, though, that not all LCD screens are like that. When I got an external monitor at work, for example, it was over-bright, with washed-out colours and poor contrast. A few months ago I finally retired my three year old ThinkPad X201 Tablet PC and bought myself a fantastic new Gigabyte P34G laptop. This is from Gigabyte's high-end P Series gaming laptops and is a very impressive piece of tech. To fit all that technical goodness into a low cost, thin-and-light package you have to make some sacrifices. Thus the P34G doesn't have the best build quality (mine already has a tiny cosmetic crack in the plastic keyboard housing) and a sub-par soundcard. Actually, the soundcard itself might be okay but it's not tweaked and configured to sound as good as it should. For an audiophile like me, this is a problem. However that problem is easily remedied by bypassing the laptop's on-board hardware and using an external USB soundcard. I now use the iBasso D-Zero DAC and headphone amp which is small, cheap, and easily transportable but still sounds really good. On balance, though, this is a fantastic laptop and I am really happy I bought it. So, if you're in the market for a thin-and-light family laptop with an excellent screen and discrete graphics card, I would highly recommend the Gigabyte P34G. Every since Squarespace 6 launched in July 2012 I've been meaning to upgrade our old Squarespace 5 site to this newer CMS version. I wasn't in any rush to do so - Squarespace said they'd keep supporting the old CMS version indefinitely - but I finally reached the point at which the old site started to look boring and I was itching for something new. I've really enjoyed building this new site because Squarespace 6 is a really fun CMS platform to design on. I particularly love how it handles images - which you'll notice are now front and centre in this new site version. So, what do you think? Do you like the new design? In case you haven’t already noticed, we’ve upgraded our website. We’ve moved from a basic, static HTML site that was built in 2008 to one that’s hosted on the fantastic Squarespace platform – which, by the way, I highly recommend. We upgraded the site because the old one was…well, old. Also, it was too manual and time consuming to maintain. This new site, on the other hand, is leaner, faster, and, overall, a more effective online presence for both me and Nadia. The web has also changed a lot in four years. For example, your own website no longer needs to host your entire online life. You can do things like outsource your media storage and sharing to services like Flickr, YouTube, and Picasa Web Albums. And, on the social media side, you can outsource a lot of your micro-content and general web content sharing to services like Twitter and Google+. But you know what the best part is? Using a professionally hosted web content management because that really makes website management both easy and a lot of fun. What do you think of the new site? Love it? Hate it? Don’t care? This news is exciting because I love watches – not as pieces of jewellery, but as gadgets that tell the time. I always need/want to know what time it is and, as a result, have been wearing a wrist watch almost every day since the early 80s. Why buy a second watch when I already have a perfectly good watch that I love and wear all the time? First, the watch I have right now is too thick to fit comfortably under the cuff of my work shirts. As you can see in the picture below, the watch on the left, which is my current watch, is much thicker (16mm) than the watch on the right (8.6mm), which is my new one. Now, because my current watch is so thick, for the last year and a half, I have actually not been wearing it to work every day. I know! Crazy, right? Fortunately, I carry two smartphones with me all the time so, even though I’ve been without a watch at work, I have always been able to keep track of the time. Second, well…let me put it this way: Where is the one place you can't use a smartphone to tell the time? In an airplane, of course – specifically during take-off and landing. And what company do I work for now? Oh, yes, an airline. So what happened to me last month? I flew to Sydney for work and, for two extended periods of time (well, at least they felt like extended periods of time), I was chronologically disadvantaged because I'd had to turn my phones off and had forgotten to wear my bulky-but-still-functional watch to work that day. Scarred by that experience, I decided to look for a nice, cheap, simple, and, importantly, thin watch that I could wear to work. Obviously, I was only going to look at Casio watches. Unfortunately, there are no Casio outlets in Melbourne so I was stuck with the limited selection on display at Angus & Coote and Thomas Jewellers on Bourke Street in the CBD. Neither of them had what I wanted so I went to trusty old Amazon.com to see what I could find. That was when I discovered that online retailers sell most Casio watches at about a third of the price that local brick-and-mortar retailers sell them at. Wow. I am never buying a watch from a local brick-and-mortar retailer again. Yes, I get a little obsessive when it comes to buying gadgets. Especially those I’ll be using frequently for a number of years. Heck, I wouldn’t even be writing this blog post if I wasn’t that obsessed with this stuff! Finally, after getting Nadia's preferences, I made my decision and placed my order. As it happens, Amazon ended up being just the front-end for this purchase because my actual order was placed with the appropriately named MrWatch. It’s simple, good looking, and, fits very comfortably under the cuff of all my work shirts. Of course, this is the first analogue watch I’ve had in years so using it to tell the time is taking a little getting used to. I can’t just take a quick peek at one part of it, for example. I have to look at the entire watch face before I can tell what time it is. Not that this difficult to do, of course. I’m just not used to doing it. I am liking its leather strap, though. And I am enjoying the sight of the second hand as it spins around the clock face. I discovered only today that, late last year, Alexander Davidson released a new version of my all time favourite text editor, Metapad! Before I upgraded this afternoon, I’d been using its previous version for at least ten years (via a recommendation from Chris Pirillo). The latest version has a higher quality icon (which is really cool) and integrates fully with Windows 7 so it’s now my default text editor. Yes, you have to do a little OS-level tweaking and hacking to make that work…but it’s so worth it. When the battery on my latest watch started to die for the second time a couple of weeks ago (I’d owned this one for about 5 years) I figured it was time for me to buy a new one. But, before I get to that, here’s a quick trip down memory lane of the Casio watches that I remember owning over the years (thanks to Watch Shock and their awesome watch archive). I bought this simpler type because I don’t use my watch as often as I used to. That’s mainly because the ProTrek was too bulky to wear under business shirts so I couldn’t wear it to work every day. This new one isn’t much thinner but I’ll certainly give it a try. That said, I do still wear my watch whenever else I’m out of the house and I do keep it next to my pillow every night. Following on from my post on ‘How to be Alone’, I have two articles two share. One that I remembered from earlier this year and one that I read today. Being bored is a precious thing, a state of mind we should pursue. Once boredom sets in, our minds begin to wander, looking for something exciting, something interesting to land on. And that's where creativity arises. My best ideas come to me when I am unproductive. When I am running but not listening to my iPod. When I am sitting, doing nothing, waiting for someone. When I am lying in bed as my mind wanders before falling to sleep. These "wasted" moments, moments not filled with anything in particular, are vital. They are the moments in which we, often unconsciously, organize our minds, make sense of our lives, and connect the dots. They're the moments in which we talk to ourselves. And listen. I need reflective processing time desperately, I’ve learned. Not because I’ll stop functioning without it. On the contrary, I look more “normal” to others when I don’t have it. But to be the woman I want to be – emotionally generous, not cranky or erratic or jaded; to be spacious and open and deep, to have a presence that feels to myself and others to be grounded and alert and graceful; to be someone who brings more sanity into this world instead of contributing to the craziness, then I need downtime. To deal with colleagues and professional partners in a rational and calm way, to manage the challenges of my work effectively, to show up creative and focused everyday, I need to process what comes into the ecosystem of me. I agree wholeheartedly with both Bregman and Mohr. One of the reasons I bought a tablet PC was so I could be truly mobile in my computing. An important part of mobile computing is to have Internet access wherever you go. And the obvious and most reliable way to get that access is to have your own mobile broadband connection. Last year I got that connection from 3. I bought from them a USB mobile broadband modem and signed up for a prepaid month-to-month data plan. This year I went one better. I bought and got Lenovo to preinstall an internal broadband modem (the Qualcomm Gobi 2000) when I bought my tablet PC. I did that because I didn’t want to carry around a USB modem that I’d have to plug in every time I was out and about and wanted to connect to the Internet. If you don’t already have a mobile broadband connection it’s pretty easy to get one from one of your local mobile carriers. pick up the ‘3 Mobile Broadband Prepaid Starter Kit’ (which will include your SIM card). Do read the BYO Modem page on their website before you go ahead and do that, though. In my case all I had to do was take the SIM out of my USB modem. Inserting the SIM card into your laptop (or tablet PC, as the case may be) is really easy. Then put the battery back on and you’re done. Assuming that you actually have a broadband modem installed in your computer and that all your drivers are up-to-date, you now need to turn your modem on. If this doesn’t happen you probably don’t have a modem installed (check in Device Manager in Windows) or your modem isn’t configured properly (run Windows Update to get its latest drivers). Next, you need to set up the connection to 3’s mobile network. Since I already have a Location Profile for my connection – called ‘3 Mobile Broadband WWAN’ – I’ll show you what its configuration is by clicking the ‘Edit’ button instead. There’s no need to change any advanced or additional settings. Click all the ‘OK’ buttons and you’re done. Go back to the ‘Connect to the Internet’ tab and you should now have ‘3 Mobile Broadband WWAN’ listed in your Location drop-down list. Select that and click the ‘Connect’ button next to it. It should take about 10-20 seconds to connect…and off you go! If the connection doesn’t take place then something hasn’t been configured properly or your account with the mobile carrier hasn’t yet been activated. I can’t help you with the former (because I’ve already told you all I know) and the latter you should already have worked out with the salesperson at the mobile carrier’s store. If further tweaking fails and you can’t find the answer on the Internet then you should take your laptop to the mobile carrier’s store and ask for help (or, alternatively, call them up and get help over the phone). But if all this has worked then you should now be connected to the Internet via your mobile broadband connection. Yaay! Nadia and I have maintained our website at insanityWORKS.org since 2004. It was overhauled once (in 2007) and is past due for another major upgrade. This time, though, the plan is to move it on to a Content Management System (CMS). Much as I love getting down and dirty with HTML code (via Dreamweaver, of course) a CMS-based site will be much faster and significantly easier to maintain. At the very least we won’t be stuck managing it from only those computers that have Dreamweaver installed on them. The question then becomes: Which CMS do I choose? I’ve been using both proprietary and open source systems since 2001 so I know a lot about a lot of them. That means I can use pretty much any one that’s out there quite effectively; though I do plan to use an open source one for this site. Fortunately, my choice is limited by the ones that my web hosting provider, E-Starr, provides automatic support for (specifically, installation and upgrade support). I’ve used a bunch of these CMSs in the past, too, so I’m already quite comfortable with most of them. What’s left, then, is mostly text content and a couple of archived websites. Any old CMS can handle the former and latter will remain the way they are so, all told, my CMS requirements are actually quite simple. Not to mention WordPress, which can be tweaked to make a pretty good CMS itself. 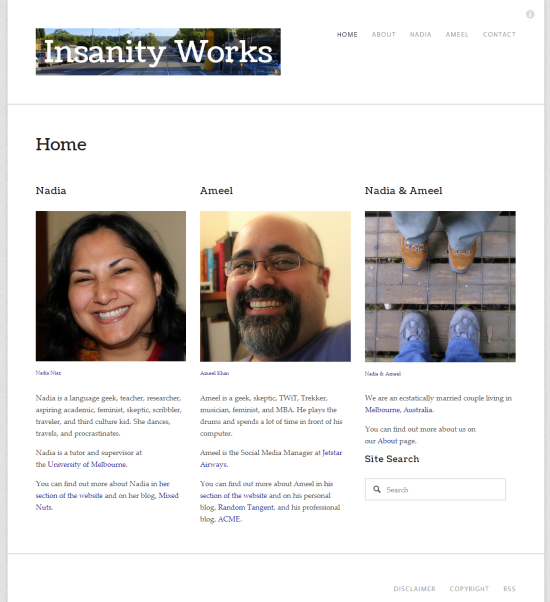 So, if all goes well, I will report back in a few weeks, by which time I hope to have the newest version of insanityWORKS.org up and running.